Note This version works for the recorded version as well for the acoustic one. Otherwise you can transpose. You won't try to save me! You just want to hurt me and leave me desperate! Chisel my heart out of stone, I give in everytime. I bet you believe, that I'm better off with you than someone else. Your face arrives again, all hope I had becomes surreal. I know that to go on, I'll break you, my habit! 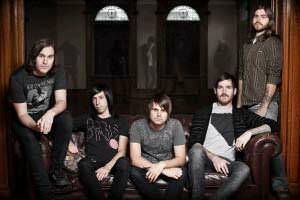 Silverstein is a 5-piece rock band from Burlington, Ontario, Canada; formed in 2000. The band name was taken from the famous children's author Shel Silverstein. After several lineup changes, the band acquired Billy Hamilton, a local fan who learned of the band's need for a bassist on the Internet message board "The 905 Board" (an Ontario area outreach board which used to be for local musicians). In Christmas of 2001, he joined the band after Shane Told helped him learn the music for the songs. Following a rehearsal on Boxing Day (December 26) in 2001, he officially debuted with Silverstein. .